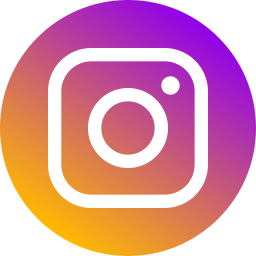 We found service to be prompt and extremely efficient. Our waitresses were friendly and quick to deliver water to our table and take coffee orders. 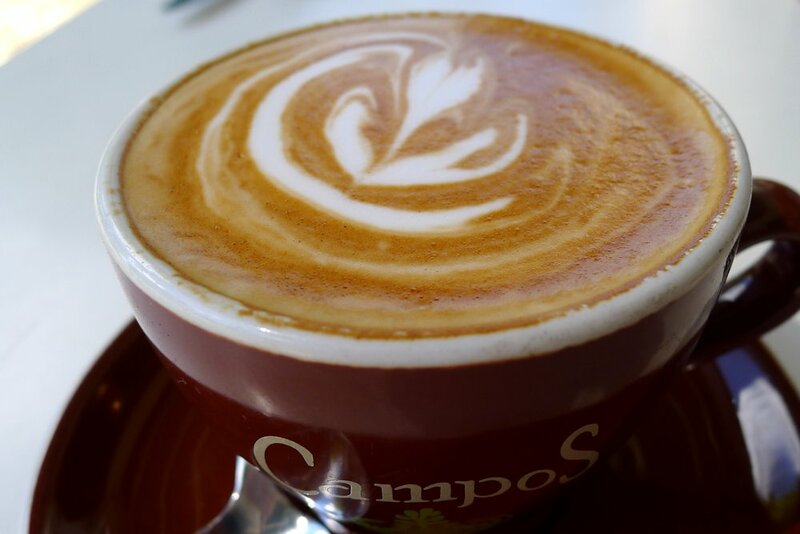 Eighty Ate serves Campos coffee. Enough said? If not then: the coffee was fantastic. Our flat whites ($3.50) were slightly on the slow side but so worth the wait. Some of the best in the local area. Piccolo lattes, macchiattos ($4 each), affogatto ($4) and hot chocolate in a mug ($3.80) are also available. Eighty Ate has their cold beverages down! 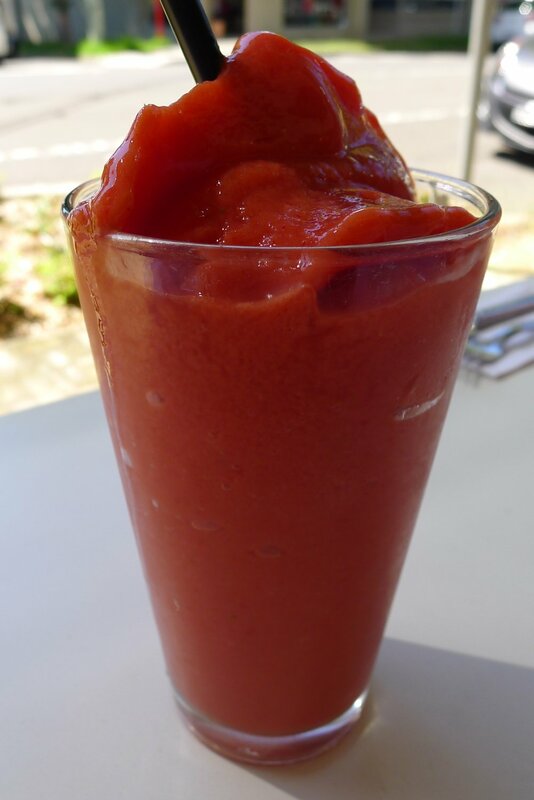 As well as milkshakes (chocolate, strawberry, caramel, vanilla or coffee, $4.80), fresh juices (orange, apple, pineapple, watermelon, carrot, celery, beetroot or ginger, $4,80) and frappes, they seem to be smoothie experts too. Strawberry, banana, mango or mixed berry are the choices. 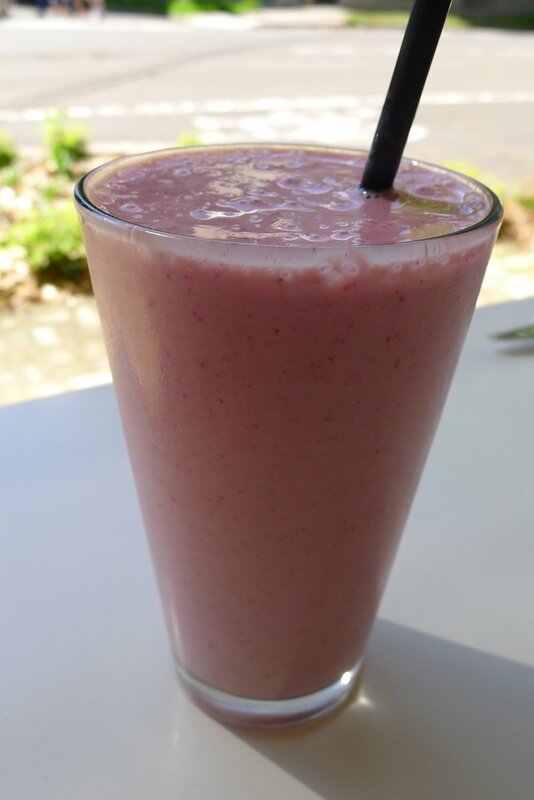 Our strawberry and banana smoothie ($5.50) was fantastic with fresh fruit used as well as being ice cold. The frappes ($6.50) seem to be something special as well. With varieties such as berry surprise (mixed berries, banana, cranberry juice and pineapple sorbet), mamba (mango, banana, orange juice and pineapple sorbet) and blueberry blast (blueberries, strawberries, cranberry juice and raspberry sorbet) one definitely is spoilt for choice. The tropicana is a mix of strawberries, pineapple, mango, cranberry juice and raspberry sorbet. Very refreshing with a good amount of fresh fruit, it’s the perfect drink for a hot summer weekend. While the breakfast menu contains the usual breakfast suspects (and they all looked great on other patrons’ tables), we opted for dishes from the specials menu. 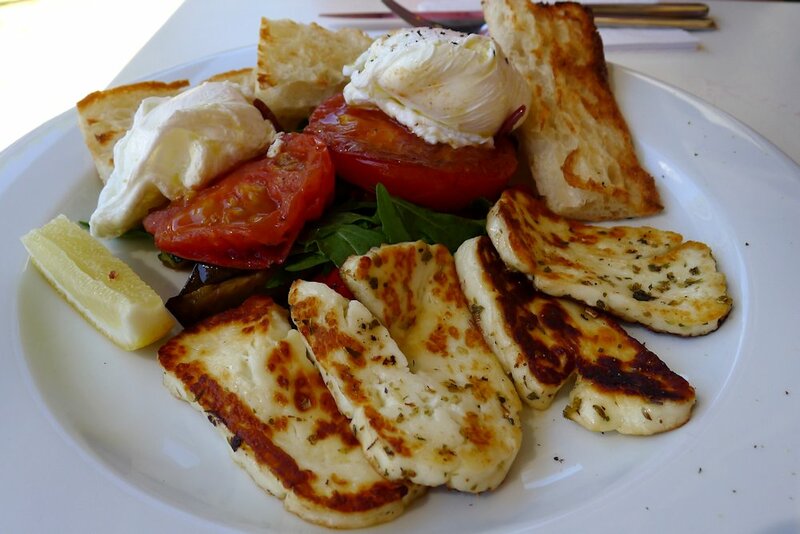 The grilled haloumi ($15.50) arrived with plenty of the promised squeaky grilled cheese as well as herbs and lemon to compliment. Roasted eggplant beneath as well as zucchini and roasted tomato make this a perfect vegetarian dish. We were highly impressed and realised we had finally found a café worthy to rival the ones we review on the South side of the bridge! The Turkish toast was crunchy and light and a worthy substitute for the pita bread promised on the menu. The other special item we spotted straight away was the corn fritters. It’s always interesting to see how this very common dish is prepared at different establishments. The fritters themselves were similar to what we were expecting – plenty of corn, light and fluffy with a crunchy exterior. 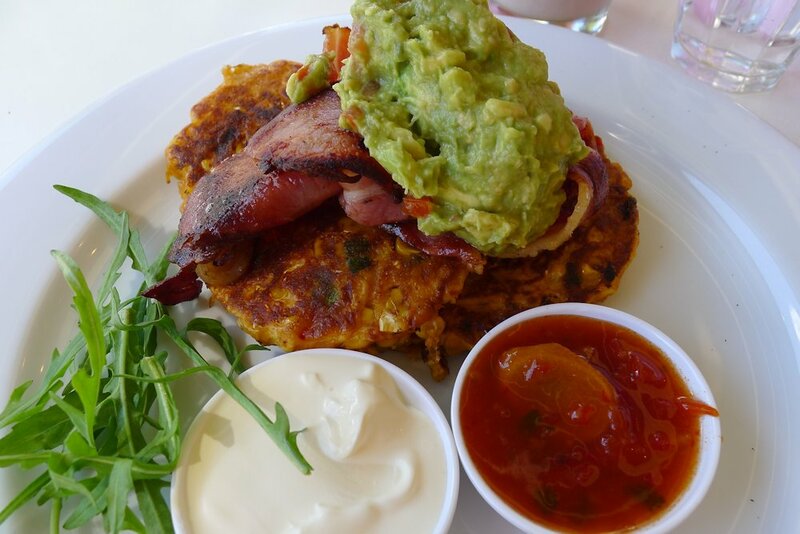 Topped with delicious bacon and a slightly spicy guacamole, we found all elements to be extremely well prepared. Where the kitchen excelled though was the homemade chilli jam. They would not divulge their recipe but we detected a multitude of ingredients including ginger and capsicum. It was very spicy and for fans of food with a kick, we can highly recommend these fritters. While the coffee and food was slightly on the slow side, we otherwise could not fault the service (hence the five stars) and the food and drinks were definitely worth the wait. The atmosphere goes a long way and we will be back to enjoy some of Eighty Ate’s other dishes. Eighty Ate’s menus are available online. They are open for licensed lunch as well so be sure to drop by. 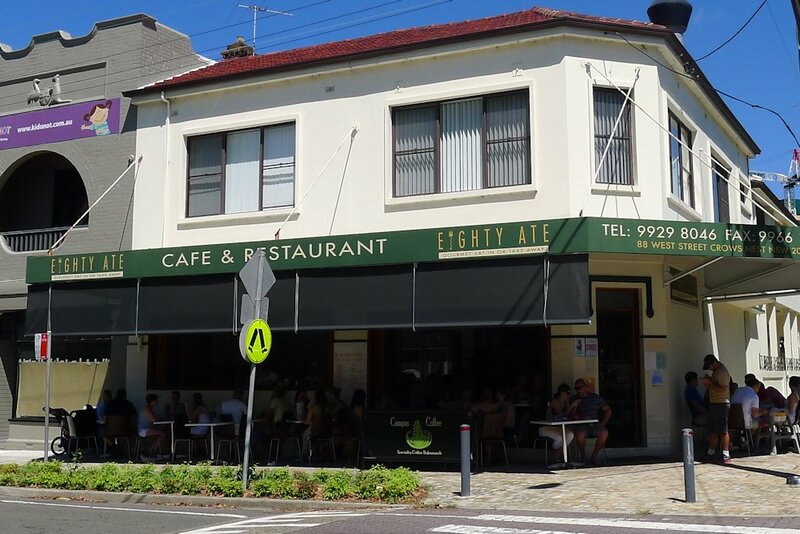 Its very nice to see the review of cafe Eighty ate here. one of my favourite cafe in North area. Great food, Friendly service, Feels very special when i’m there.